A chess mat is basically just a large, thin, flexible and soft chess board used primarily in tournaments and chess clubs. There are however several different types of chess mats and each type has things that make it unique, they are not just a floppy chess board! 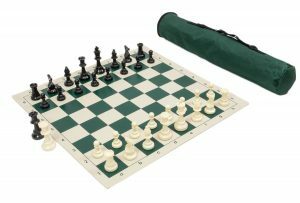 This chess mat is usually the least expensive type of mat and is highly durable. 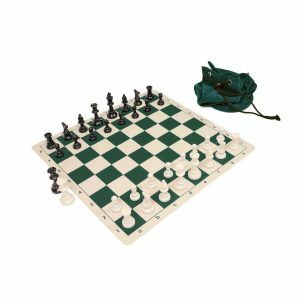 The vinyl chess board can come with cases and pieces such as this Archer Chess Set from Wholesale Chess at around $21, or you can get just the mat such as this mat from WE Games for around $12. Most clubs will use this type of mat because it can be used for years by different students and still be in serviceable condition giving it them the biggest return on their investment. While better ones will lay flat and not present problems, the cheapest of this type will often show creases and have curled edges, particularly after being used for long periods of time. Curled edges can sometimes be temporarily solved by using a hair dryer on low heat setting and having the mat upside down on a solid surface. Once it has been straightened out, storing it in a tube opposite of the way it was previously rolled up will help. Unfortunately, once these get many years old, it is really hard to keep them flat and may be time to replace. These chess mats really should be stored rolled up so making sure you get one with a case/tube to store them in is pretty important. Most people will tell you to roll them up with the playing side to the outside so that they tend to lay flatter when removed from the tube and placed on a table. 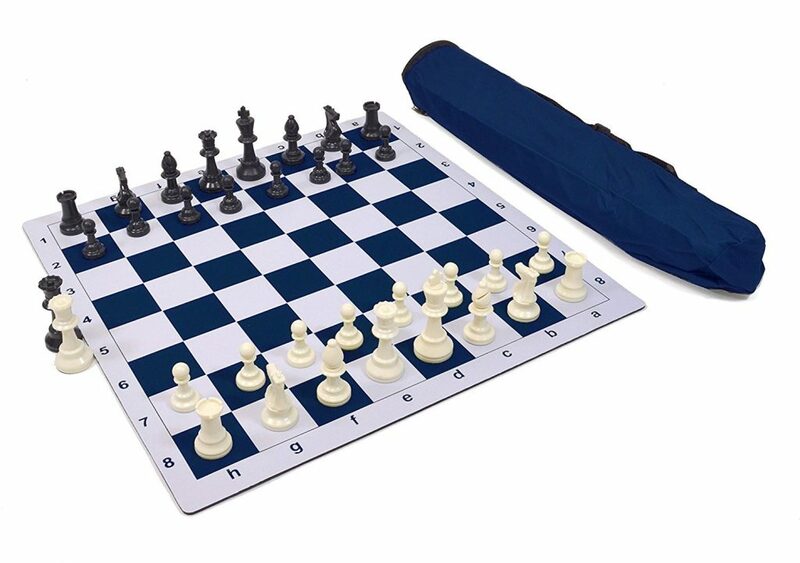 Silicone mats are slightly more expensive and come with storage bags and pieces such as this Triple Weighted Staunton set from Wholesale Chess for around $27, or just the mat for around $16 like this 20″ Silicone Roll-Up Chess Board also from Wholesale Chess. When comparing a vinyl vs silicone chess board, silicone will tend to lay flatter than vinyl, and they tend to grip the table they are placed on which the vinyl mats do not. They also do not tend to curl over time like the vinyl mats do and so should last longer when taken care of. You may notice when searching for silicone mats online that you have a hard time finding them with the same tube style carry bags as the vinyl mats, this is because the silicone mat does not have to be rolled up and can instead be folded and placed in a smaller bag. Even when folded, the silicone mats will not crease and will provide a flat and smooth playing surface. The down side to a silicone board is that since they are grippy, they not only grip the table on the bottom, but can grip dust, dirt and even the pieces on the top. This means gameplay is not as smooth as on a vinyl or mousepad style mat. You can however easily clean them with warm water and a soft rag. If you have ever used a soft mousepad then you know what to expect from this type of chess mat. They are even more expensive than the silicone with this 20″ Tournament Mousepad Syle board from Wholesale Chess running you around $19. If you are looking for a complete set, try my favorite Triple Weighted Mousepad set with case for about $30 from Wholesale Chess. This type of chess mat provide most of the smooth play and speed that the vinyl boards have with the grippy bottom and extreme flatness as the silicone. Just like a mousepad however they will tend to pick up a lot of oil and dirt from your hands making them look dirty. While you can clean them a little using a rag and some warm water, they do tend to separate the cloth top from the rubber bottom just like a mousepad so be careful. You want your chess mat to be regulation size so you can not only use it in tournaments and your local chess club, but so others playing with you are used to the same size board. Fortunately that is pretty easy because all of these board styles come in the correct size which is about 20″ with 2.25″ squares. When I say about 20″ that is because the size can vary slightly depending on the sides of the board. The squares are only 18″ wide (2.25″ x 8 squares) so the board typically varies between 19″ and 20″ with most being around the 20″ mark. Any type of chess mat should be stored in a chess bag or case like this Deluxe Chess Bag from The House of Staunton. The absolute preferred method is to have a case where your mat can be rolled up with the playing surface on the outside. This makes sure that the mat will lay flat immediately when placed on the table. Pieces should be stored in their own container or bag, and that can be placed inside the rolled up mat. Letting the pieces fly around loosely in the tube can cause them to bang into each other at speed and damage the pieces. Sure, they are not that expensive, but why not just put them in a little draw string bag and not have to worry about them. I hope this article will help you pick out a chess mat that is right for you!